Saturated color straight from the tube is great. Color adds to the expressiveness of a painting or it attracts attention to a work as the saturated color pops into someones view easily. Though this does not always tell the full story we wish to communicate. Sometimes painting with saturated colors straight from the tube can cause the colors to compete with each other, creating confusion within a scene. When painting realistically, we will need to change the value level or the lightness and darkness of the color to relate the local area of the image to the scene as well. 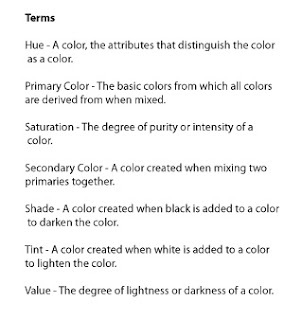 Shades and tints are one way to adjust the lightness and darkness of of a color. Today, we are going to look at these. We will look at what shades and tints are, how they work, and we will look at some reasons why we might want to use them. Shade is the term used to describe a color that has been mixed with black to darken the color. This can be useful when painting an area in shadow. For example, if painting a blue couch that has a single light source coming from one side, parts of the couch will be in shadow. To change the value level of those areas of the couch in shadow we can add black to the blue to lower the level of perceived light in that area and darken the couch. Tint is the term used to describe a color that has been mixed with white to lighten the color. Tints are useful when working in the light areas of a subject. Using the blue couch again, some of the light areas of the couch will receive more light than others. This will cause the value levels to change within the light area. Mixing white with the blue used for the couch is one way to lighten those areas to look like more light is reaching those spots. Both shades and tints can be used to reduce the saturation or intensity of color without any consideration for the effects of light as well. An example of this might be when painting for a Christmas card illustration we may decide we want a deep dark red in the illustration rather than a bright red. We can add black to our primary red to get the desired shade. Let's look at tints first. As mentioned above, a tint is a color mixed with white to lighten the color. 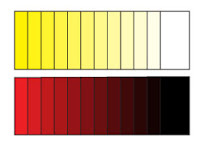 Below we have charts illustrating each of the primary and secondary colors mixed with different levels of white to demonstrate the effects of adding white to a color. Underneath each color is a value scale, where the color has been removed, to show the effect adding white has on the value. Notice how each color has it own value level to begin with. Each color starts at a point of lightness or darkness unique to itself. Blue is darker than yellow, for example. This is useful as we can use tints to lighten colors to match the value level of the other colors nearby in order to get all the colors to relate to one another within a scene. A shade is a color mixed with black to darken the color. Below we have similar charts illustrating the effect adding black will have on a color. Again, the chart below the color illustrates the value level of the color with the hue removed. Something to be aware of with both shades and tints is when we add white or black to a color, the color itself changes. Not only are we changing the level of light found within the color, we are changing the hue as well. The effect can be slight within the color, but it can have dramatic consequences to the composition. For example, we may choose to lighten a red area to show the form as it is affected by light. If we decide that the light is a warm light, the red area that we add the white to will not read like it belongs under that light source. This is because the white changes the hue of the red, cooling it more and more as we add more white to it. The effect will be that parts of the red area will look like it belongs under a cool light source, while the rest will look like it belongs under a warm light source. To resolve this we can add warmer colors to adjust the hue as well. Shades and tints can also be helpful in highlighting color. If we reduce the saturation of all the colors around one color, by making them shades or tints, that individual color will appear brightest and stand out against the other colors. Shades and tints are useful tools in reducing the saturation of color or changing the value level. Keeping in mind that that black and white will also shift the hue of the color, we can still use shades and tints effectively in our composition. I use oil paint mostly. The pallette I use can vary but I usually stick to a limited color pallete. Tipi can find more on the colors I choose in the painting basics section under the limited pallette article.